Facebook traffic has been on a steady decline in recent months. Their spokesperson says they’re not concerned about making publishers happy so it’s unlikely this decline will change anytime soon. This is probably why SEO traffic is now seeing a mini-renaissance in coverage. After all, before Facebook traffic this was the only real way to get your website seen: You had to arouse people’s interest so they’d react to your information and want to consume more of it. This meant your website’s content had to be something they could relate to or something that evoked some type of emotion from them – preferably inspiration or anger, maybe even a mixture of both. Social-optimized content has an overt, eerie familiarity to it. This is because it continually favors positive sentiment and exaggeration, leaving no room for negativity or subtlety. The only real antidote for this is SEO traffic. At least with SEO publishers were forced to focus on providing their audience with relevant information – not sugar coating the truth. Of course, this doesn’t mean that SEO content isn’t gross and annoying at times. However, it’s starting to see somewhat of a comeback after having been ignored as a major topic among web marketers for the past couple of years. 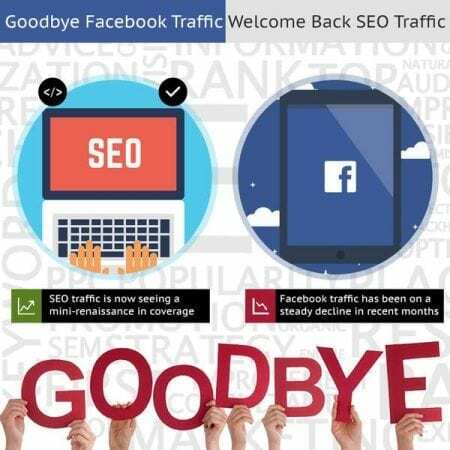 While it’s true that nobody ever altogether gave up on SEO traffic, it was often foreshadowed by Facebook traffic. This trend started occurring in the primary season, which happened in March 2018. During that time, many online news mediums were competing for those rigorously searched for and tracked competitive keywords. They wanted to be highly ranked in the SERPs for a collection of keywords related to the candidates and certain stories about them. News and political editors were desperately trying to make sure that the evergreen, election resource pages they were using to explain the candidate’s positions and policies were all highly optimized for the most competitive keywords out there. In fact, the night before the final election occurred, many of them drafted several different headlines based on all the different possibilities for election outcomes. They wanted to make sure they’d be the first to hit the internet with SEO optimized news stories so they could be certain to get the most SEO traffic. This is a strategy that worked for many of these websites. In fact, many of the smaller online news outlets were beating out the larger, national outlets based on these search terms. Looking back, these same websites soon discovered that during the week leading up to the primaries this process generated about 60% of their traffic meaning that only 40% of their visitors were coming from Facebook traffic. We live in a world where it’s important to use a variety of platforms to drive our marketing message home. We can’t completely say goodbye to Facebook any more than we can forego good SEO. It’s a delicate juggling game that you as a business owner probably don’t have time for so contact us at ISEOU and let us start helping you with it today. Previous PostPrevious Local Backlink: And Where Can You Find It?